Arriving by Amtrak from Vancouver, we were only doing a one day in Seattle before getting back on the train to Portland. 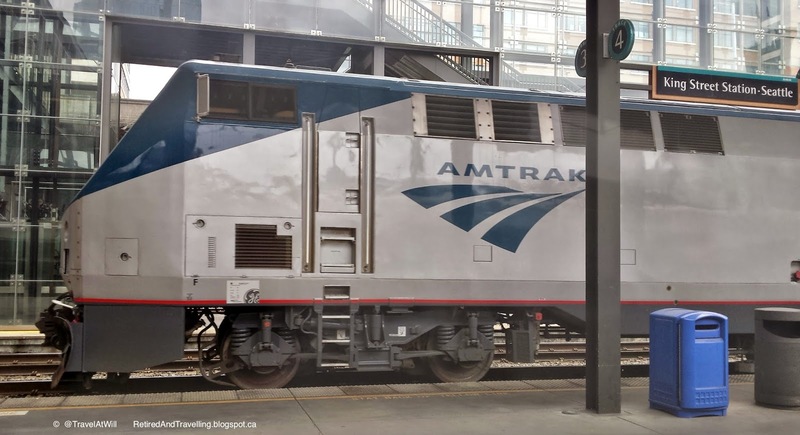 For our thoughts on the Amtrak Cascades train, see the separate Amtrak post. We had no fixed agenda for our one day in Seattle but just wandered about and enjoyed our first visit together. We had both been here separately a long time ago. We were very pleasantly surprised by this little hotel in Belltown. I went “thrifty” because we only had one night and found the hotel was clean, well kept and located within easy walking distance from most points of interest. Had we stayed later in the trip, we would have definitely taken advantage of the laundry on site. Wifi was free in the lobby and only a minimal $5 charge for in-room. The rooftop patio with lots of flower pots was a nice place to rest although it didn’t really give you a view of all of the sights. 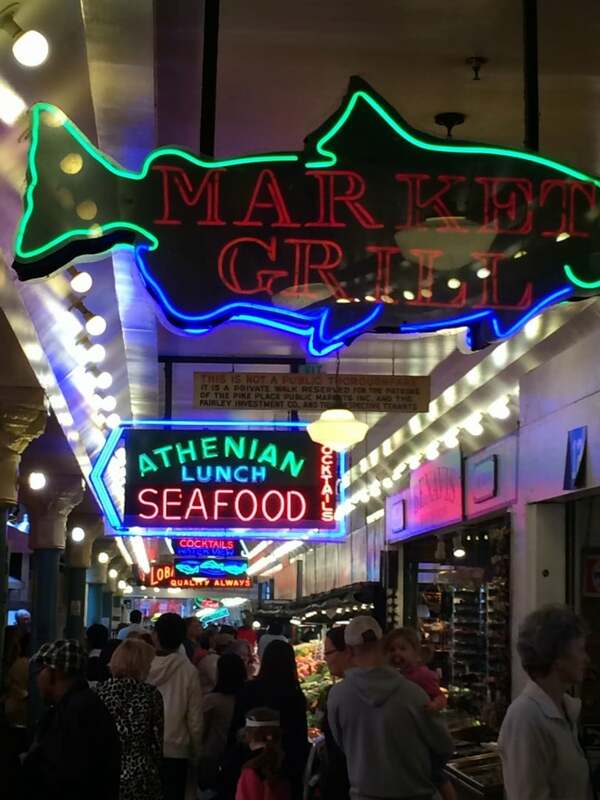 No trip to Seattle can miss the Pike Place market. 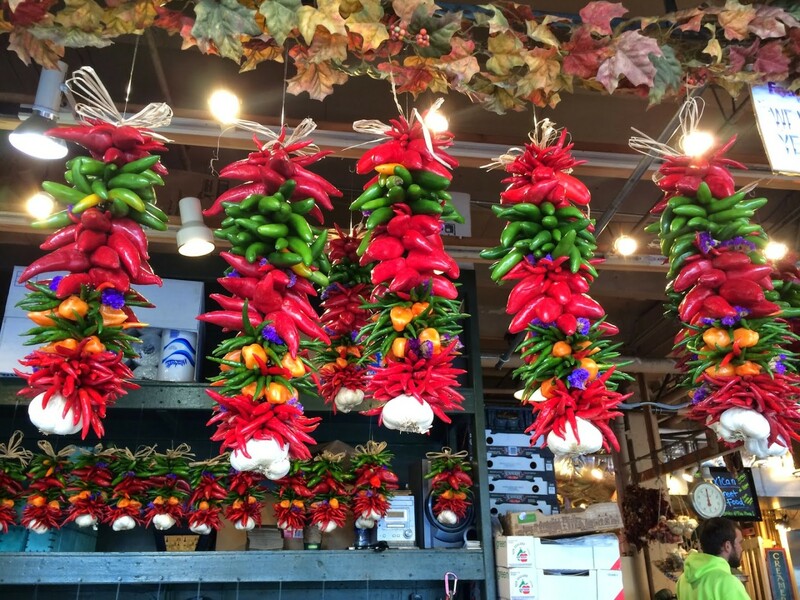 It covers multiple blocks, having grown organically into several markets. It is a broad mix of food stalls with crafts and other wares – marked with bright neon signs or quirky displays. 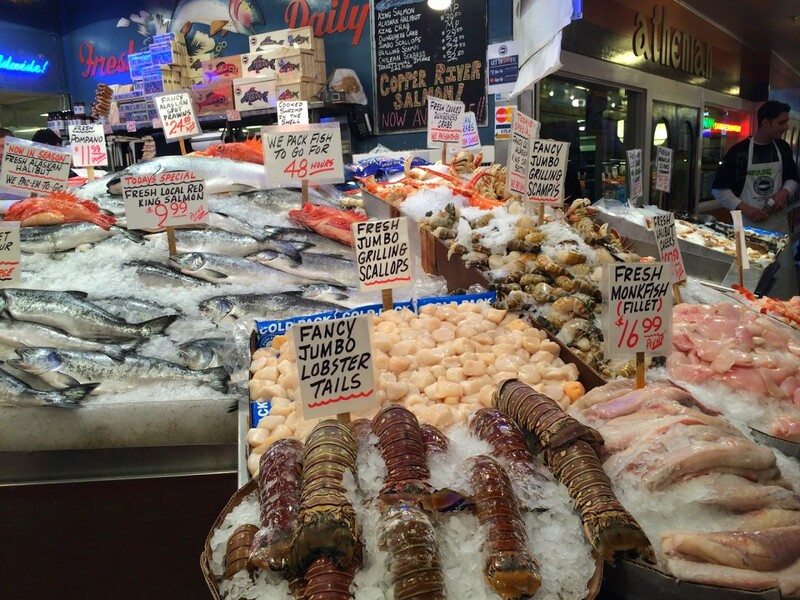 The fish is fresh and plentiful and if you wait long enough you will see flying fish. This tourist attraction halts traffic when a selected fish is thrown up to other staff for packaging. The fruit selection is great, with organic options as well. Samples of in season produce are offered to tempt you. There are lots of options to grab a snack or lunch – sweet and savoury. When you are at Pike Place you will likely find yourself by the very first Starbucks – obvious by the number of people snapping photos. If you miss that one, it will not be hard to find the next one. Most of the coffee we had in Seattle was really good – showing competition can be good. Standing at the lookout spots in the Pike Place market you would mistakenly think that there was no waterfront. All you see from the market is the highway with the Ferris wheel in the distance. But if you keep walking down the hill toward the water you come to a lively waterfront. 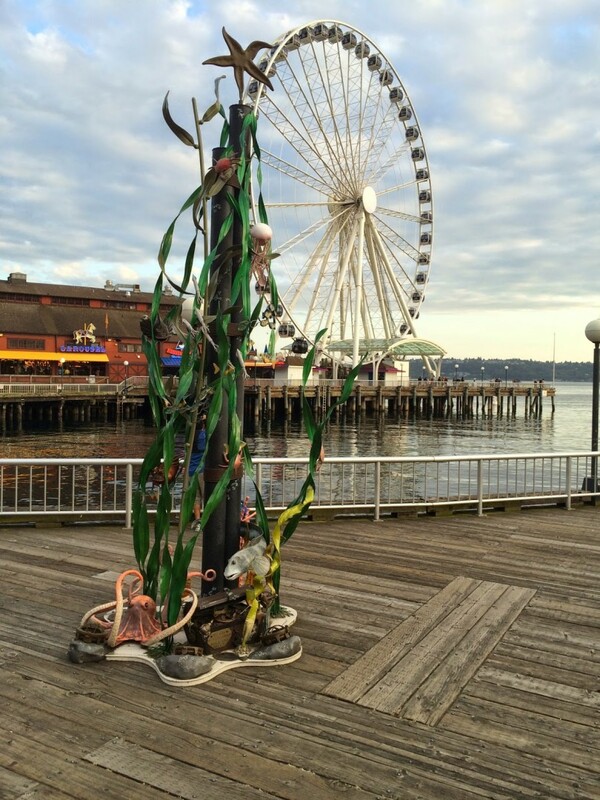 The Ferris wheel is at Pier 57 and on the quay beside this is the Seattle Aquarium. Interesting art pieces provide something to see, even when the aquarium is closed. If you keep walking along the waterfront you hit a small marina and several raised pedestrian bridges to get back up the hill to the city. The Seattle Needle is visible pretty much anywhere you are – but coming from Toronto and the CN Tower, it was less tempting. We wandered in that direction but never quite made it. A short stop at the Seattle Glass Blowing Studio (5th at Bell) turned into a wonderful immersion in a vast assortment of art glass, much of which rivaled what we had seen in Murano outside Venice. I couldn’t wait to start designing my glass plate wall. We got a recommendation to go to the Crab Pot from a guy we talked to while sitting in the hot tub in our Vancouver hotel. It was a huge place but on a Tuesday night we were still able to get in without waiting. We ordered traditional fare (fish and chips) but really wished we had ordered the special plates for two – which came steaming hot in large bowls, dumped on paper in the centre of your table. All around us people were wielding their hammers cracking crab legs they took from the piles in front of them. While the guy at our hotel was a bit off in his directions, it was still a short walk from our Belltown hotel. They had a great choice of breakfasts and you would be sure to not leave hungry. Coffee was good and the service quick and friendly. The guy seated in the table beside us made sure we ordered bacon crispy – the best bacon he said he had ever eaten. I wouldn’t go quite that far.